Rumour has it farmers break the ice layer in water troughs during the winter months in Mooi River to allow their animals morning drinking. This is totally believable considering the sub zero temperatures we wake up to at this time of year. I’m a summer baby who would prefer to hibernate when temperatures plummet. I survive winter with comfort foods such as feel-good, rich, hot chocolate; thick vegetable soups; meaty stews; spicy curries and traditional, hot, sticky South African desserts. A winter vegetable that often misses the limelight on today’s menus is the unassuming but extremely versatile and tasty cauliflower. Nothing beats a thick creamy and velvety cauliflower soup. It’s perfect on its own but, at the restaurant, I often top it with truffle-oil-infused crème and caviar. A less extravagant but equally as impressive option is a rosette of smoked salmon. My version of oxtail changes continuously in the quest to make it as good as my mother’s. Oxtail is difficult to present in a fine-dining setting so I often remove the bones and fill a chicken breast with the meat mixture for poaching. Be it elaborate or an effortless pot of oxtail, both are appreciated for their unpretentious depth of flavour. 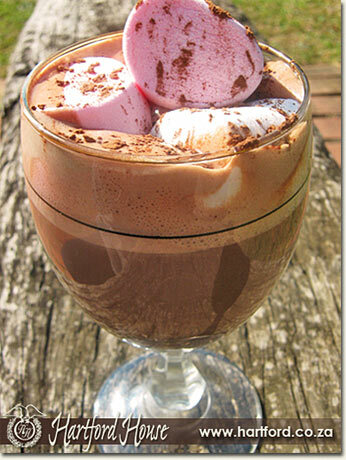 South African winter desserts top the popularity pole. Who can resist a helping of a hot, syrupy, moist cake? This versatile, sticky date pudding is delicious as a cake, or a dessert when topped with caramel sauce. Serving it with orange marmalade ice cream is a real treat. A winter’s night would not be complete without a log-fire and a rich, creamy mug of homemade, hot chocolate. Think cream, Bar-Ones and marshmallows … yummy! Use these recipes to take the chill out of your winter.